Written on the Body – We are What We Do. My body is slowly recovering from the seven day marathon, of exploring and listening to, the broad church of music that is, Broadstairs Folk Week. But with all the eating, drinking, dancing and walking, also essential elements, full participation requires physical (if not mental) stamina. And as I have explained on previous blogs, an absolute necessity for my personal enjoyment of the festival, is to be able to draw the musicians as they perform and over the years I have become addicted to this live, in-motion, participatory type of drawing. However, it is not without its physical discomforts, risks and even bodily injury. This year has seemed more physical than most, right from the start, on the opening night. As I stood at the front of a packed bar, standing being the only option, into the throng, wove two delightfully drunk teenage girls who preceded to; lurch, lean and sing, in front of the legitimate performers. Twice I had to prevent them from falling backwards on to me, which culminated in a small, handbag-related injury. The good-natured crowd eventually got fed up, especially with the leaning, and the girls got properly told-off, but were so charmingly remorseful, it was easy to forgive them, especially when one of them, put her arm around my shoulders and said breathily into my hair, “I love you, I love your drawing, it’s well-good – I love you…” etc. The next morning, I found out that two hours of standing-drawing, even with alcohol, was probably too much. 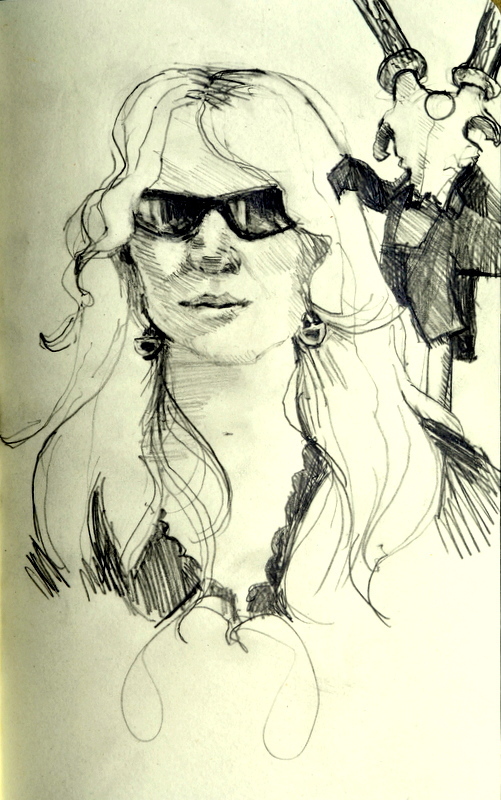 Years of drawing in the melee of the crowd, has taken its toll on my right, sketchbook-holding arm, which tends to go rigid when I concentrate and then my spine joins in, from now on, I will have to find things to lean on. But later that day, numb with Paracetamol and Shandy, as I was drawing two violinists, I noticed the way that even their young bodies had already begun to mould themselves around their instruments, their faces flattening into chin rests and elbows bending into waists, all echoing and exaggerating the lines and curves of their instruments. We are what we do. The day of my second injury, a small cut on my toe, the result of running from a downpour, had the happy consequence of causing us to take shelter in a low-ceilinged, dark bar where two men were dancing and tapping on boards, in what seemed like an early, infectious, form of beat-box. They managed to dance, sing and play instruments, simultaneously, accompanied by a wild Nordic-looking man, with blonde dreadlocks, who swung his double-bass like a cricket bat. It sounds crazy and they are, in the refreshingly eccentric and original treatment of an eclectic array of old songs. I tracked, stalked and drew them three times, almost defeated by the constant motion of their bodies that tested my patience, as it meant waiting for a particular gesture to repeat. At their final gig, grey with sheer end-of-festival knackerdness, they gave their all, in a storming performance that transmuted the grimy, sweat-stained pub, where your feet stick to the floor, into what felt like the O2. So many moments, so many tiny decisions about what to include and what to leave out, each one, rich with the potential of a thousand possibilities and their consequences, including failure. This yearly drawing marathon has its own peculiar mental space which allows a pause to reflect on my drawing. This year I came across a performer that I last drew, anonymously, twenty-five years ago. In the interim we have both aged in parallel, perhaps this is what made me so aware of the ravages that time and music have reaped on him. But when he played…all that fell away and the pure, clean sound caused a memory-loop back to the first time, and in that spiritual space, we, musician and artist, were united. We have still not met and don’t need to, the most important thing is that we both keep doing what we do, for love, for all of us, we are what we do.